First group meetings of activists in Perrënjas and Librazhd, organized by IRIS Network member Partnerë për Fëmijët, have marked the successful beginning of the implementation of the project “Strengthening Citizenship and Advocacy with Persons with Disabilities” in Albania. Meetings have connected young people with disabilities, their parents and family members with representatives of local authorities and relevant institutions involved in delivering social services to disabled. Project implementation is ongoing in two municipalities with high rate of people with disabilities – Perrënjas (app. 600 among 27000 inhabitants) and Librazhd (app. 950 in a community of 50000 citizens). Within the project, Partnerë për Fëmijët is investing efforts to motivate and educate youth with disabilities to advocate their rights and teaching how to institutionalize their participation. Project activities are directly engaging 125 beneficiaries. They are learning how to develop conduct surveys, analyse data and develop priority action plan, lobbying to relevant institutions ensuring adequate social policies and practice. Approximately 1500 youth with disabilities are to be indirect beneficiaries. Being a young person with disability in Albania means narrowed opportunities for a decent future and lack of social integration. Ineffective institutions and social stigma leave youth with disabilities and their parents in non-optimistic chances for improving life conditions. The necessary support for this vulnerable group of youths as well as to authorities in integrating people with disabilities, comes through project. The mission of the project is to provide young people who are struggling with different types of disablement with proper social services, based on their expressed needs. The project “Strengthening Citizenship and Advocacy with Persons with Disabilities” is one of 12 projects financially supported by IRIS Network through small grants programme “Improving the provision of Social Service Delivery in South Eastern Europe through the empowerment of national and regional CSO networks”. Establishment of strategic and action framework for the improvement of life conditions of Roma citizens in 6 municipalities of Tuzla Canton will be available thanks to the project “Development of Local action plans for effective social inclusion of Roma”, implemented by the IRIS Network member – Association “Euro Rom”. 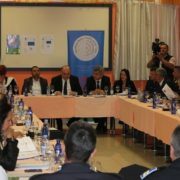 Efforts of the Association to involve the Roma population in Tuzla Canton in decision making processes, by overcoming weaknesses of the National Action Plan for Roma in Bosnia and Herzegovina, are supported by local authorities and relevant institutions in social and minority protection sector. The policies and practices in the area of social inclusion of Roma in Tuzla Canton are to be improved by the end of 2016. City of Tuzla and five surrounding municipalities –- Zivinice, Lukavac, Srebrenik, Celic and Kalesija, are home to approximately 15000 Roma (app 20% of total Roma population in B&H). The process of their inclusion in society is not complete yet. Up until today, stepping stone was missing – defining of a strategy and local action plan for inclusion. Within the process, Roma people will be provided with high quality social services, understanding the importance of the inclusion in the community and decision makers. These are the main goals of “Development of Local action plans for effective social inclusion of Roma” project. The latest round table event organized by “Euro Rom” brought together 52 participants, among them representatives of the Ministry for Human Rights and Refugees B&H, Ministry of Education, Science, Culture and Sport of Tuzla Canton, Ministry of Interior TC, City Council of Tuzla and Commission for National Minority Rights Protection. They were involved in meaningful discussion on challenges of Roma community within the inclusion process and expressed the support to the project activities. The project “Development of Local action plans for effective social inclusion of Roma” is one of 12 projects financially supported by IRIS Network through small grants programme.